I play a few online Poker Tourneys, mostly on Full Tilt Poker, of which I am an affiliate (see my FTC page for disclosures). Some of the times the event is a Twitter Poker Tour Event and some of the times it is a RailBirds.com event – I am a member of both fine groups. The poker game I play the most is texas holdem – and it is quite a challenge. While cards matter some, it also helps to know your opponent’s tendencies. Does he open light for a raise (starting with a weak hand such as KJ versus a pocket pair or AK). Does he re-raise light. 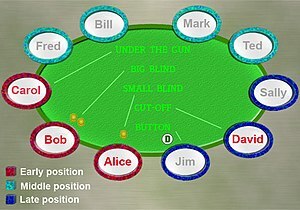 There is a lot that goes on in a no limit holdem game and to succeed,you need to keep your wits about you. It is a good idea to keep notes, but also be aware that an opponent might play differently from one day to the next or even from one hand to the next. Do you take notes? Does it help your game? Poker is usually not easy …. On November 16th, I participated in an online poker event on Full Tilt Poker. 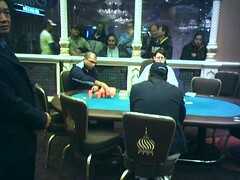 The event was a freeroll for members of the blogging community members of the Twitter Poker Tour. The event was called a Flearoll in honor of the administrator of the event, Paul Ellis, also known as “Fleapid” on the FTP site and @CoolWhipFlea in the twitter word. Paul’s blog is found at http://www.pablosplace.com/ and is a source of great poker stories and news. There were 9 people entered in the event and to make it interesting Paul invited a couple of FTP Pros, Rafe Furst and Steve Yea, to join us, giving us a total of 11 people in the freeroll. There was only one prize, a Step 4 ticket, valued at $75 to the winner. The fun part, for me that is, was that for some reason or another only 4 live bodies showed up to play. There were two tables to start. The only live players on my table were: Fleapid and Street3. Also at the table were Rafe Furst and Steve Yea, but for some reason they did not show up and were sitting out. Why it was fun? Well, when both Steve Yea and Rafe Furst were in the big and small blinds, I would raise and they would fold. I would raise enough so that both Fleapid and Street3 would fold. I got to steal a lot of chips that way before it became obvious what I was doing. By then I had enough chips to push around the table. And then Fleapid had to sit out (Paul was covering the NAPT and had to take a break from poker). With a combination of good hands and well timed bluffs, I was able to relieve Street3 of his chips and was moved to the final table. At the final table there were 6 remaining players, myself and @CprPoker (Geoff Manning, owner and manager of the Twitter Poker Tour) and four others that were sitting out. It took about 15 minutes before there were just the two of us remaining. Fleapid came back back but only had $15 in chips left. He busted out chatting something about “bad beat” but maybe I imagined that part? Geoff and I were heads up with practically identical chip stacks. The battle took about an hour but in the end I had all the chips and won the coveted FTP Step 4 ticket with a value of $75. Have you ever played an online poker freeroll and found most of the players sitting out? Were you able to take advantage of the situation? Even though I busted out in 35th place out of 85 players, last night was an exciting night on online poker. Because the Twitter Poker Plays on the FTP site, they have been able to attract the attention of some of the FTP Pros, who will occasionally play with us at one of the TPTPoker tourneys. Last night was no exception as Pascal Perrault and Esther Rossi joined us at the tables. They chatted with us during the game, adding a new dimension of fun, being able to play and talk with the pros and the rest of the TPT players. Have you ever played in a Twitter Poker Tour Event on Full Tilt Poker? That does not mean I am not interested in the biggest live poker tourney, the WSOP main event for 2010. In particular, the final table, which has a great line up of players. What makes this year’s group of nine more interesting to me is the fact that 7 of the 9 final table players have been signed up to represent FullTiltPoker, the online site that I play on the most. Because of FTP’s involvment, they have created a site that you can visit for up to date information and videos: WSOP 2010 Final Table Coverage. Just click on their names to go to the site. With 8.9 million dollars for first place, what’s not to like? Do you have a favorite player of the final nine? Do you play on FTP? Have you ever played big entry price tournements?